Donald Trump's Twitter account has retweeted three highly inflammatory tweets from British far right group, British First. The first tweet, shows a "Muslim migrant" attacking a man on crutches. This was later followed by two more. The tweet were originally posted by Jayden Fransen - the group's deputy leader. The group are known for spreading hoaxes and the videos seems to be another in their long list. The first video, which has the capton "Muslim migrants beats up boy in crutches." was a video released in May in a Dutch website and was a fight between two 16 year olds. The group was founded in 2011 and are notorious for their staunch anti-migration and anti-islam rhetorics. 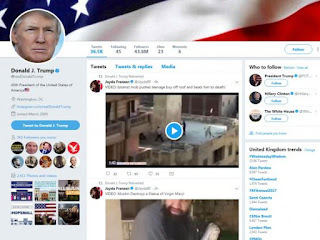 Jayden Fransen who, obviously elated thanked the President is subsequent tweets, saying: "God Bless you Trump! God Bless America." In another tweet, she said: "Donald Trump himself has retweeted these videos and has around 44 million followers." Ms Fransen is currently charged with using threatening, abusive and insulting word in Northern Island is due to appear in court in December 14th.